Put a cork in it, Chris! Nope, this sort of thing NEVER happens in elections. 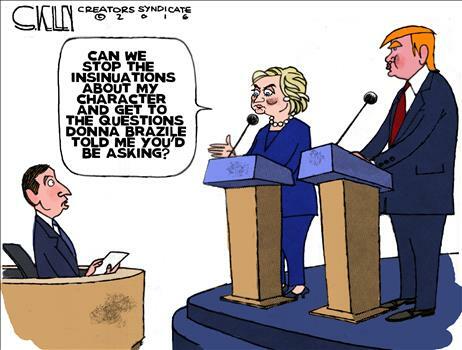 I’ll have to admit, I liked last night’s Presidential Debate…most of it. Unlike the previous debates where the “expert” journalist moderators quickly lost control of things and the topic firehosed everywhere (except for the question being asked), Chris Wallace did a fair job of keeping a handle on things. The media blacked out Wikileaks story was mentioned early on, in which Clinton tacitly acknowledged the authenticity of them during her answers. Clinton digging a bigger hole for herself by claiming the Russians had a hand in the release of internal e-mails that democrats never thought would ever see the light of day (and did she forget that “donation” to the Clinton Foundation for Uranium Mining Rights???). We certainly cannot forget the next generation of terrorist attacks her in America due to her ill-conceived “asylum” program from Syria. Break out the tissues while she spins a tale of woe on the “migrants”. OABTW, how anyone can really “vet” someone’s record, when there is no government to contact regarding said record? Nope, absolutely positively nothing to worry about here! Admittedly, I’m a little fuzzy on where the whole “accept the outcome of the election” meme came about. Why Chris Wallace kept pressing THAT issue threw everyone for a loop on an otherwise well-done debate (and in which the “experts” glommed onto like your wouldn’t believe post-debate “analysis”…now they don’t have to mention Wikileaks at all). His insistence on getting that question answered pretty much shattered any notions of this debate being any different than the previous ones. Although, I have to admit, I’m liking how Trump is playing with the simpletons in the media even this morning, but the question needs to be asked: Why does the media continue to regurgitate that bunk? Has the media so quickly forgotten the election “irregularities” when LBJ was first elected? The election “irregularities” in Chicago during the ‘60 election? Dead people voting (and not just in Detroit this time)? And then there is this from the Tri-County Area just this morning: Missing AV ballots. Yes, the Wayne & Oakland County Clerks (Cathy Garret & Lisa Brown) are both democrats. But to be fair, this one isn’t on them. According to The Detroit News, the US Postal Service is fessing up as being the culprit here, although they have been reticent on explaining the particulars on the how & why part. I’ll bet that you won’t see THAT story being promulgated throughout the media in the coming days? "...Lilley said another issue is his office received completed absentee ballots clearly addressed to clerks’ office in four other communities: Bloomfield, Brandon and Waterford townships and Owosso. “No one can explain that to me either,” ..."
Tea Partiers have had 8 years to elevate voting, expansion of FOIAs, radically changing the OMA or transparency in general as their primary issues should they fail to accomplish anything further. Locally fixable voter fraud continues to be the #1 obstacle to freedom that it has been since the first Gadsden flew in this century. The fact that Michigan Republicans would do absolutely nothing about this both when and where it mattered most was both well known and documented from day one of the movement. Instead, 'giddy' Gadsden waivers were recruited to sit in polls gathering information on their neighbors for Romney's (failed) 'Orca' data mining machine. TPers became more worried about whether RomneyBots were frantically calling their neighbor's wife if she didn't show up to the polls after her husband did. The Secretary of State even bent the law just as much as possible to allow recording devices in our polls to accomplish this feat...Tea Partiers offered nary a 'peep' in regards to their rights being violated (ditto with having to register their chosen party years later)...and the REAL tragedy lacking simple manpower (easily avoidable voter fraud) continued unabated. A "former" CIA operative has been given asylum in Russia. He's a genius with a photographic memory and a long history of spying. Once CIA always CIA as the saying goes. Is it really "Russian" espionage solely because that CIA operative happens to be on Russian Soil? Hillary mention Putin as if he's her enemy. My take--she gave away 20% of a uranium mine to Russia through a Russian owned Canadian holding company and then took millions in speaking fees from them. Uranium is necessary for nuclear bombs and now she's surprised that Russia has more nuclear bombs than us? Lastly, and this has bothered me for some time--there were no American Flags on stage the first day of the Democratic convention--not even lapel pins--and this has continued throughout the campaign by the Democrats. Can somebody please contact China to supply the Democrats with some American Flags and lapel pins--PLEASE. As for me, my American Flags and lapel pins are made in the USA just as all the Don's campaign hats, shirts and stuff is. I proudly cast my vote for the only true American running for president.